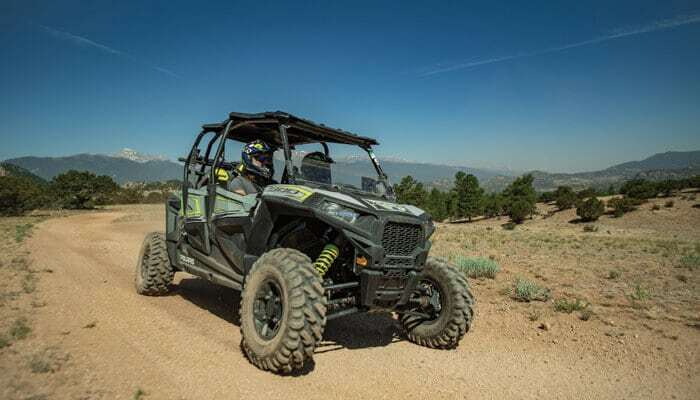 We are pleased to announce our expansion and new location in Buena Vista, Colorado where we have 3 locations within the San Isabel National Forest to launch our new fleet of Polaris 2 and 4 seat RZR ATVs for guided and unguided tours. We have also paired up with River Runners and Mt. Princeton Hot Springs to offer Adventure Getaway Packages. 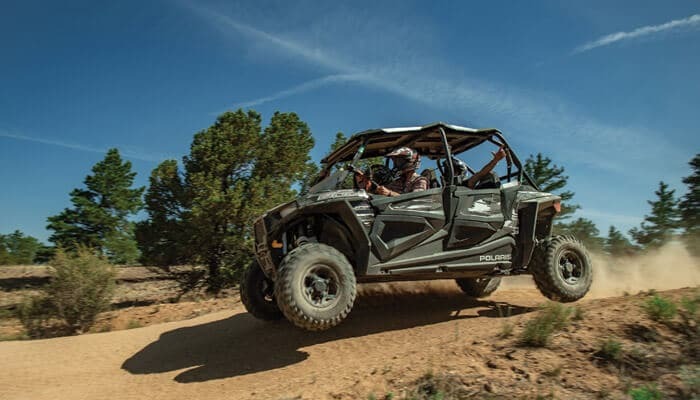 Our new location in the South Main area of Buena Vista shares the Adventure Hub location with River Runners and will have other equipment offerings such as Polaris Slingshots, OneWheels and motorcycles for rent. 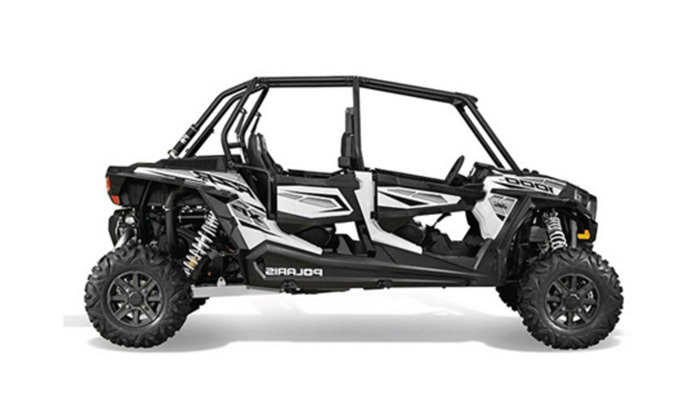 The RZR rentals will include guided and unguided, full and half day options with a choice of launch location. 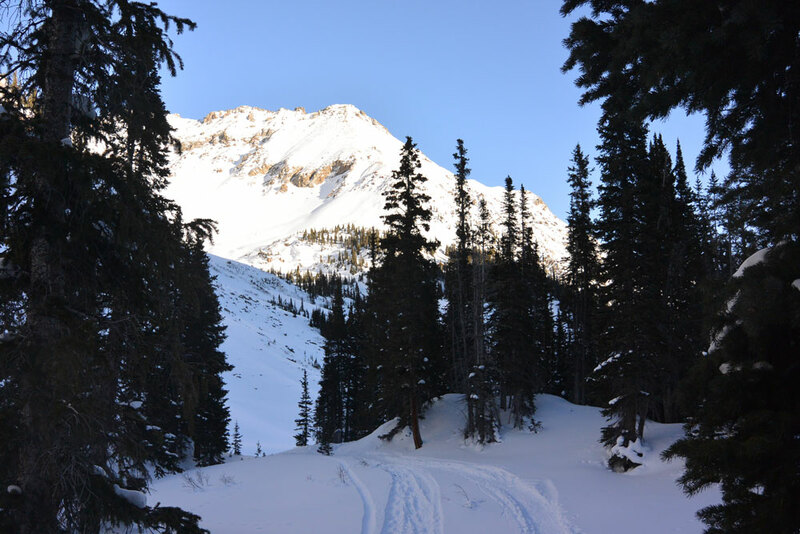 Location 1 (Trout Creek/Fourmile) and Location 2 (Brown’s Canyon/Bald Mountain) offer terrain best suited for beginner and intermediate riders and Location 3 (St Elmo/Mt. Antero) offers intermediate to advanced terrain including high alpine scree fields and technical rock sections. Half day tours and rentals start at 9am or 1pm and full day rentals at 9am. All rentals include helmets, a full tank of gas, and guide (if choosing guided tour). We will also be offering packages that can include: Hot Springs and/or Hotel packages, Rafting Trips with River Runners, and more. We are excited to become a part of the Buena Vista community and look forward to a great season. We are equally excited to announce our upcoming winter projects which will include Snowmobile and Timbersled Snow Bike guided and unguided tours and some package offerings as well. 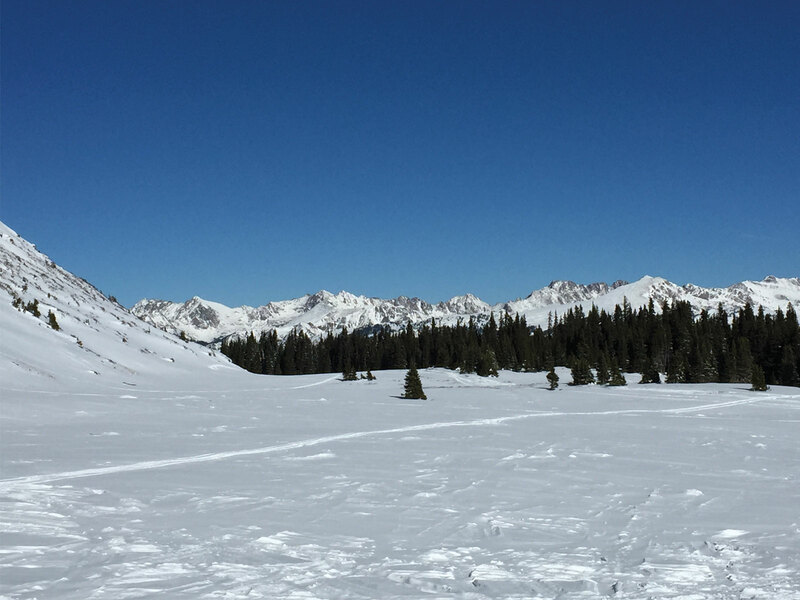 A portion of the RMAR team set out on an expedition to the Tagert Hut as a way to ring in the 2016 New Year. If the idea of a “Hut Trip” is new to you, you should know that “Hut Trips” are the types of trips that people come out of the woodworks for. They are the epitome of what a true Colorado Adventure can and should be. You plan your food rations well in advance, you pack for all types of weather conditions, you carefully consider what you need to bring vs what you want to bring while keeping a watchful eye on the weight of your pack. You will question your physical conditioning every waking hour leading up to the trip and you will constantly debate whether or not to snowshoe in or use your AT or XC set-up. You will find yourself researching new avalanche equipment, GPS equipment, and you may even find yourself researching and purchasing a handful of new maps. You will do all of this for what will in the end be nothing more than a quick 24 hour out and back expedition…. Unless you’re setting off on a true hut-to-hut trip. Having sleep accommodation’s for 6 (or a very cozy 7), The Tagert Hut is one of the smaller huts in the Braun Hut System. 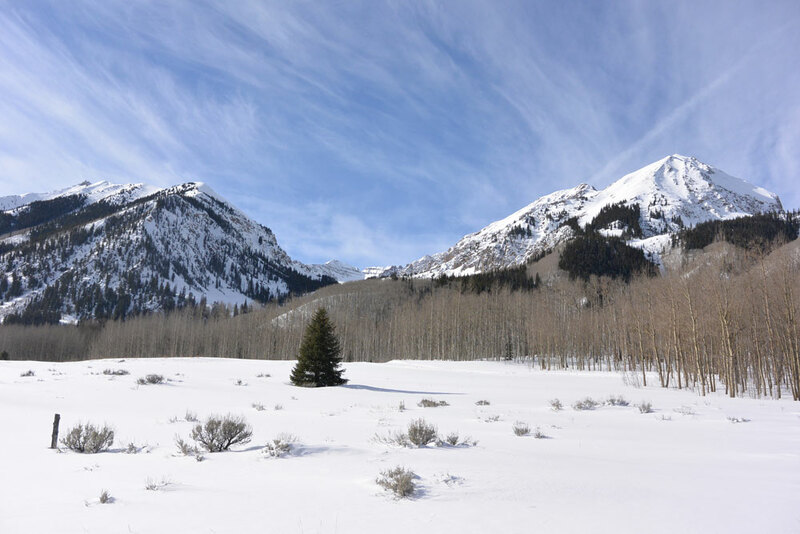 It is located south of Aspen on Montezuma Road (Pearl Pass) and is just 20 yards away from the Green-Wilson Hut. In the summer time, you can park right at the trail head if you are choosing to hike to the hut but in the winter, the main road is closed about 2 miles from the actual trail head. In the winter months it is about a 7 mile jaunt from the winter parking location to the front door of the hut. The majority of the hike is on a consistent grade and really isn’t too bad by most standards here in the high country. Where the trip becomes a little more difficult is after you cross the bridge leading into the switchbacks. At this point, you are only about ¾ of a mile away from the hut but the pitch is enough to make you want to turn back and go home. In the winter, we found that the trail is basically hard packed until you reach the switchbacks. A few of us didn’t even wear our snowshoes until we reached the switchbacks because the trail was so packed down from day use. At the end of the day, it took our slowest group member about 4 hours to make it to the hut and that included many breaks for photos, lunch, and even a long chat with a local from Aspen who was taking his fat tire snow bike for a day ride. One of the more surprising items to note is that the trail really is not as exposed as other reports claim it to be. We were expecting to be in extreme avalanche country the entire way based on what others had written but in reality, there are really only 4-5 big areas to look out for and they are up towards the top of the hike. Most of the trip included very large, steep mountains on both sides of the trail with very obvious avalanche chute outcroppings but the chances of the slides making their way to you while on the trail would seem unlikely as they would have to cross a very deep river basin first. However, that being said, as you get closer to the top, there are a few spots where you need to pay attention to your surroundings because you will be crossing some very exposed areas. So, the danger is there but it is not the entire way – maybe a just half of the way. The Tagert Hut being smaller than most, it did not offer the super cool wood burning cooking stoves that you find at Jackal Hut and others but what the hut lacked in creature comforts, it made up for in sound construction. 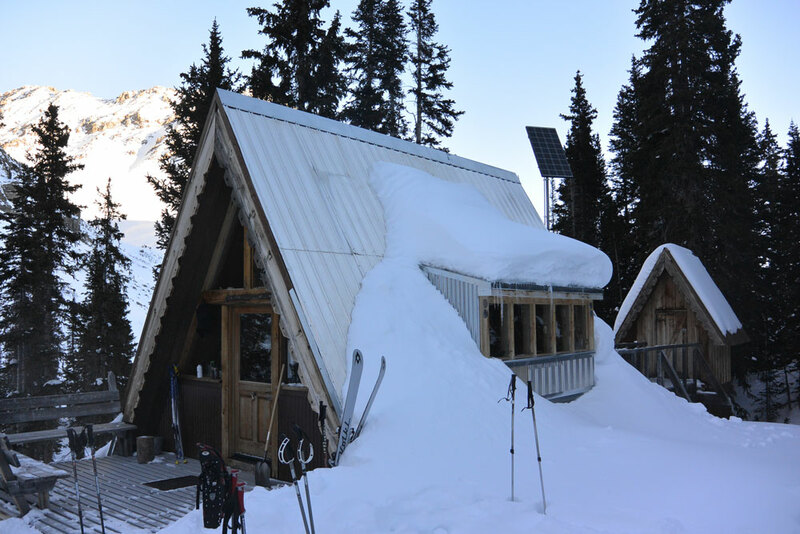 The Tagert hut is probably the best hut I have ever experienced when it comes to insulation – there was not one draft coming into that building. In fact, just after dinner, we had to kill the wood stove. It was just too hot inside. We didn’t relight the woodstove until the morning and it was mainly to help prep the cabin for the next guest. Speaking of dinner, We pre-made a Brunswick Stew and vacuumed sealed individual rations. It made for easy clean-up which is important on a guys trip. We also made Jell-O Shots and shared them with the group that was over at the Green-Wilson Hut. For breakfast we had pre-made Scottish eggs with gravy. Normally when I participate in hut trips, I try to keep the group together and work as team for safety reasons while ascending/descending on the trail. In the case of this trip, the weather and snow conditions were so perfect that the descent became more of a free-for-all. 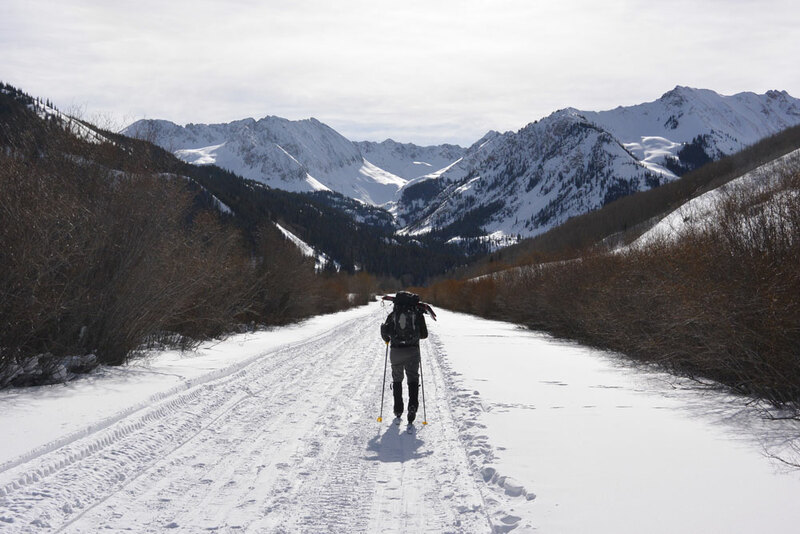 Some of us left on downhill skis and others went at their own pace on their cross-country set-ups and a few of us slowly meandered our way down on our snowshoes. It took about 1 hour for the slowest person in our group to make it back down to the car. For being the first hut trip of the season for us, I thought the trip to Tagert Hut was a success. We got lucky on weather and avalanche conditions. Even though each of us had a shovel, probe, and transceiver, I question how truly ready were to use them. If you’re going to Tagert in the winter months, I would also warn you that the propane line that is feeding the table top stove is a little finicky when the temperature drops below 15. If you would like to see a detailed map of the route we took, please visit our Colorado map and find “Tagert Hut” under the Trails Menu. Trails > Huts > Tagert Hut. 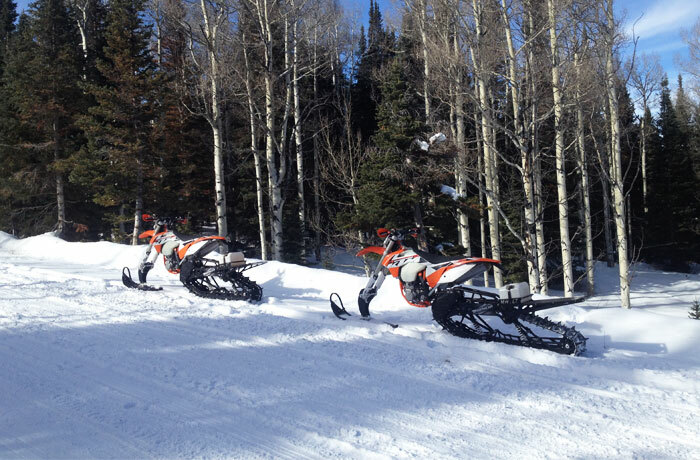 Top 3 places to ride Snowmobiles and Timbersleds in 2016. Wondering where to go ride in Colorado? 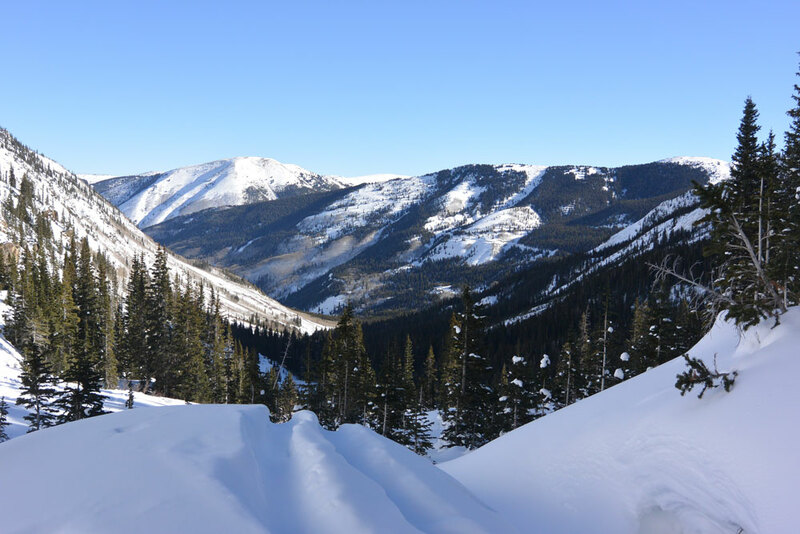 We already know that on New Years Day any place with the name “Vail” in the title is going to be super busy and this includes Vail Pass Colorado. So where can you go with your Snowmobiles and Snow Bikes (Timbersleds) to avoid the heavy crowds on New Years Day and throughout the 2016 winter season? After careful consideration, we have compiled a list from our own experiences over the past 15 years. 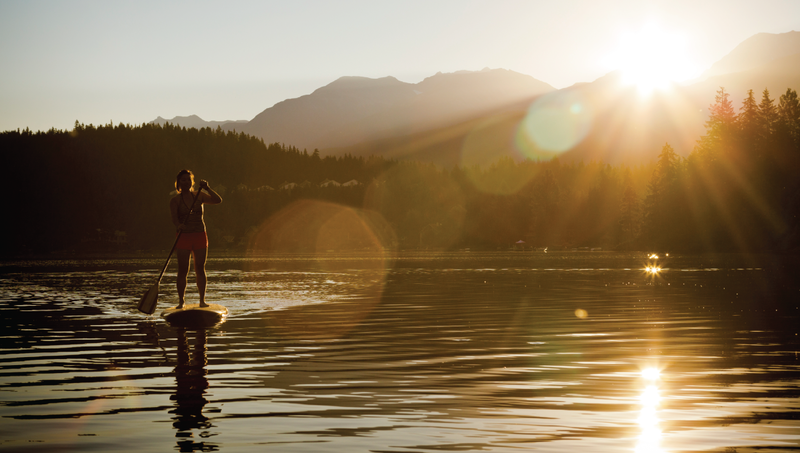 Located just west of Vail and South East of Eagle and known as a popular summer destination for paddle boarders, campers, and travelers looking to take the back roads to Aspen, the Sylvan Lake Region offers enough open space to keep you exploring for days. Most of the area is comprised of rolling hills, thick forest, and high alpine terrain with a few steep pitches to be weary of. There is even a canyon of sorts that cuts through the middle. The region is a popular destination for a few local riders but is far enough away from the front range of Colorado to keep the masses from charging the snow in full force. One disadvantage of the Sylvan Lakes Region is its distance from any gas or service stations. Those of you on TImbersleds will want to top off your spare tank before heading out and for those of you with snowmobiles, you will want to have a spare can in your truck. The town of Eagle is known for having the worst cell phone and internet coverage in Eagle County and by the time you reach your destination at Sylvan Lake, you will be officially off-the-grid so plan accordingly with GPS devices, maps and always let others know that you will be in the area and when. You can’t go wrong with Montezuma. Though it is a small open space to ride through, it just isn’t on most people’s radar. Lets face it, if you’re from the front range of Colorado and spent a few hours in skier traffic, you’re probably not willing to make the U-turn off the highway to double-back through Keystone and up to Montezuma – you most likely already have your plans in place for either Vail Pass or Rabbit Ears Pass. For those of you in Vail, it may just look like too far of a drive and why would you take an extra hour to get there when you can just pull off on the pass? Well, it’s for those two reasons that make Montezuma one of my top choices. Much like Sylvan Lakes, it stays relatively quiet no matter the time of season. 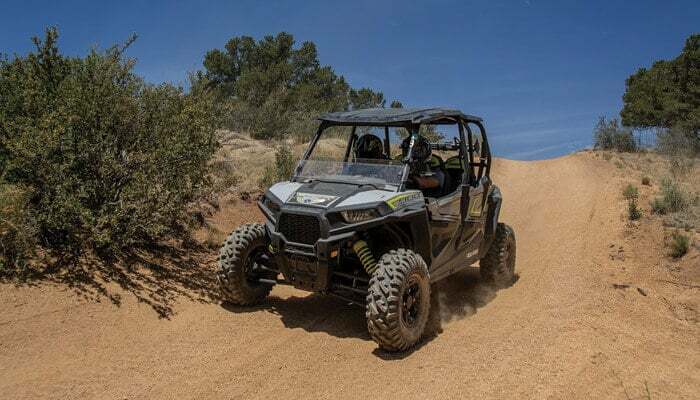 The one down side is that even though the area is big in terms of square acres, the available space to ride is really only enough to keep you occupied for about a day. Most of the riding is through narrow valleys and the mountain peaks are too steep to climb which can also make the region a high avalanche risk so you must check the conditions before heading out. Just like the Sylvan Lake Region you will be completely off-the-grid by the time you pass Keystone and your last chance for gas is in the town of Keystone. There used to be a general store in Montezuma where you could purchase food rations and fuel but we’re sorry to say that the shop closed down a few years ago. As for scenery, you really can’t beat having two of Colorado’s most popular 14ers (Grays and Torrey’s) as your backdrop. I actually discovered this area on a cross country skiing trip. We were spending the day up behind Ski Sunlight and in the distance I could hear the sounds of Braap Braaaap Braaaaaap. Once I returned home I immediately looked at the White River National Forest Open Space Map and sure enough the region is designated for recreational motor vehicle use. It’s an open and relatively flat area of land which is great for those of you heading out on a snow bike (timbersled) for the first time or for those of you who really want a chance to open up the throttle on an RMK800. The hardest part about the region is just getting to it. Navigating the slow roads of Glenwood Springs you need to get on 4 Mile Road (117) at the south end of town. If you miss the cut-off you will have to circle back in often times heavy Pitkin County traffic. Once you get on 4 Mile Road you just need to pay attention as there is a split right before Ski Sunlight. Take the split and you will loop around the ski area on the north side. As you head up the road you will see people parked along the road. DO NOT park too early on the road – the designated open space does not begin until you reach the main parking area a few miles up. The parked cars you see early on are either out cross country skiing or breaking the forest rules thereby eventually ruining it for the rest of us. Please always follow the forest service guidelines so we can keep our open spaces, open. Once you find the main entrance, you will see powder fields in every direction. Again, you will be off-the-grid at this point so have a map ready but you will quickly learn why this location is worth the drive. If you’re looking to head out into any of these regions, be sure to give us a call so that we can get you set up with your equipment early in the morning thereby giving you plenty of time to get to your chosen location. 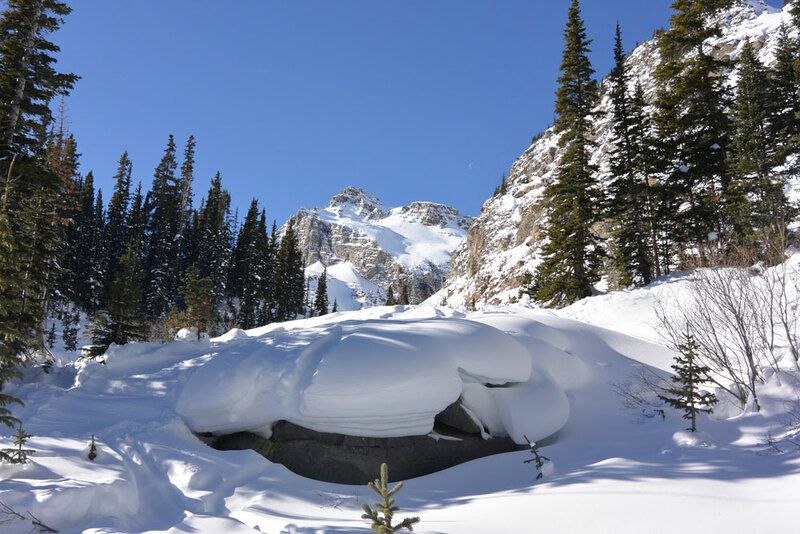 If you are going to any of these regions, or heck, any region at all in Colorado, we highly recommend that you bring proper avalanche safety gear, extra fuel, food, water, maps, and proper attire – always avoid cotton. Braaaaaaapy 2016 everyone and we look forward to seeing you out in the snow. 1. anxious or fearful that something bad or unpleasant will happen. Source: Google – When is Google ever wrong? Apprehensive is a good word to describe the start to my day. Not only was I about to ride a 2016 KTM500 with a Timbersled Mountain Horse Short Track for the first time, I was also going to have to do it with only a few random years of Dirt Biking under my belt. My dirt bike expeditions have mostly consisted of riding a Sherpa 250 through the mountain back roads on multi-day camping trips; completely different riding style than being on a KTM 500 in the snow. Beyond sporting a “Greenhorn” status, I was also a bit fearful of breaking the new toys on day 1. Apprehension aside, I woke up with a choice; go take my chances on a Timbersled or stay at home and take my chances with a sick wife (She had a cold)… So, like any good husband, I packed up my gear, checked my life insurance policy and bolted for the door. We arrived at the Colorado, Vail Pass Recreation area around 9:30am. 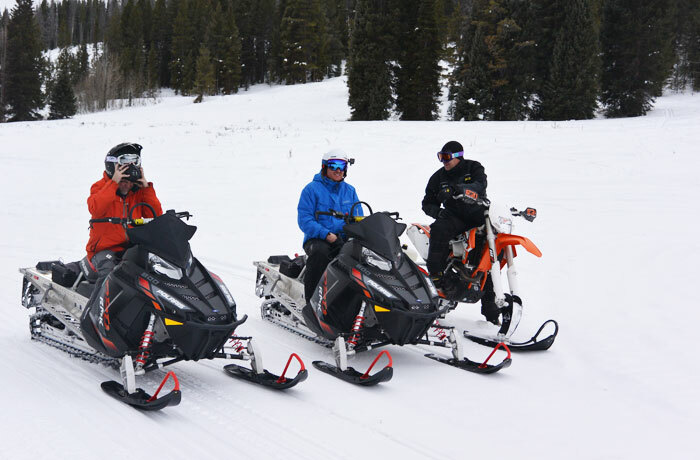 Our goal was to get home in time to watch the Broncos because to be honest, we at Rocky Mountain Adventure Rentals have our priorities. The Parking area for sleds was almost full due to the new snow, blue skies, and the fact that the U.S. Forest Service hadn’t yet started to charge for parking; living in an area where the local ski resort charges $30 to park makes any chance at doing something fun with free parking a big upsell. Once the machines were unloaded, we chose who should ride what. 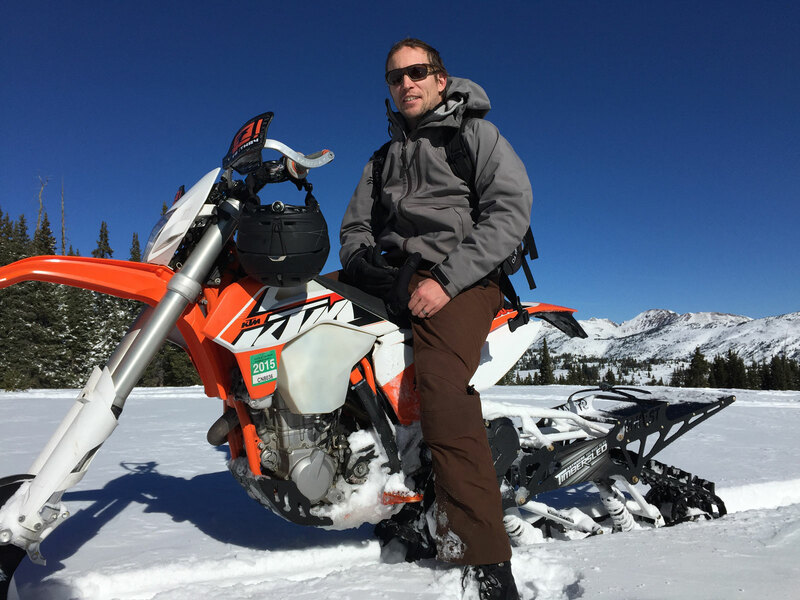 Spencer, being a long time snowmobile guide thought it best for me to start on the Polaris RMK800 Pro Snowmobile until we were far enough out to where he could make a proper judgement call; that the terrain was suitable for a newbie. So. With that. My day on the KTM 500 Timbersled began. First things first. The beauty of Vail Pass is that unlike the local Colorado Ski Resorts, Vail Pass is not covered in “slow zone” signs, “hazard” sticks and “no fun zones.” The U.S. Forest Service has their rules on Vail Pass and as long as you respect their wishes, you basically have your own mountain region to explore and explore we did. 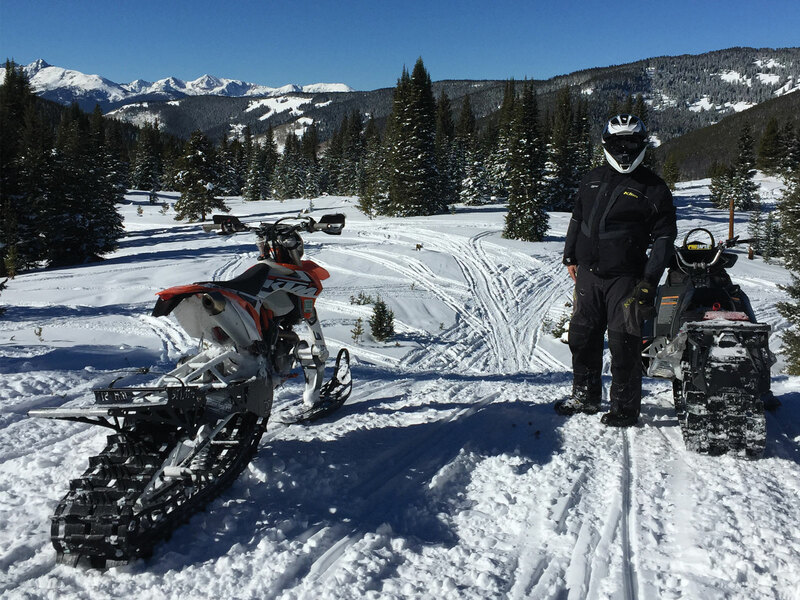 In fact, aside from allowing me to do a Timbersled Review, one of our main reasons for choosing today of all days to ride was so that we could check snow depths and make sure Vail Pass Colorado was ready to ride – so we explored every inch. I’ve guided my fair share of hut trips, rafts, backpacking expeditions etc but those are all on foot and/or water and are based more on survival tactics – not mechanics. In the end, I’m just a computer geek with an art background so I needed some learning put on me. Spencer gave me a full run through no differently than he would for a client. After the initial review of how everything works, the first thing that stood out to me was the reason behind using the Rekluse Cluth System. This is an aftermarket system that essentially alleviates the need to shift using the clutch on the handlebars. Instead, you just let off the gas when you’re ready to click through the gears. This little addition makes all the difference in the world to a novice rider; you instantly remove one more item that you have to think about. Beyond the clutch, what also stood out was the stability of the machine. The Timbersled Mountain Horse Short track is just wide enough to keep the bike upright with very little effort and once you’re in motion, you barely notice that you are riding a dirt bike. We rode around on some pack/slightly packed trails just so I could get a hang of the machine and learn how it handles. Again, my experience is on smaller 250’s so the size of the KTM 500 took some getting used to; much taller the Sherpa 250. After a few out and backs, I was feeling fairly confident. We started to venture off into the powder fields on Vail Pass and begin our day of depth inspections. 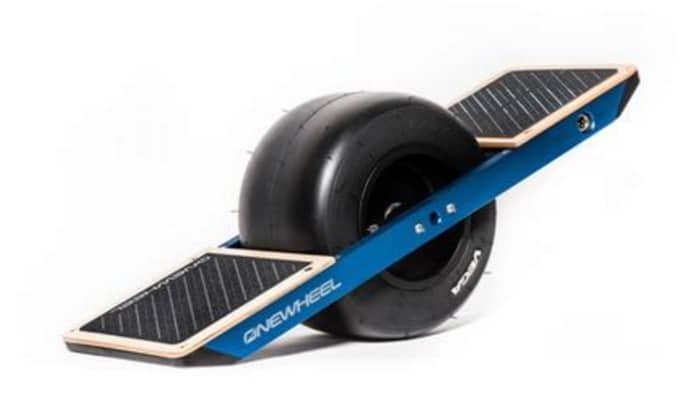 When I first mentioned these Timbersleds to others who have knowledge in the rental industry, the first response was always “oh, I’ve seen those, they don’t look like they will handle powder at all” or “Seems like they would just sink.” Those people have since been proven to be clueless. 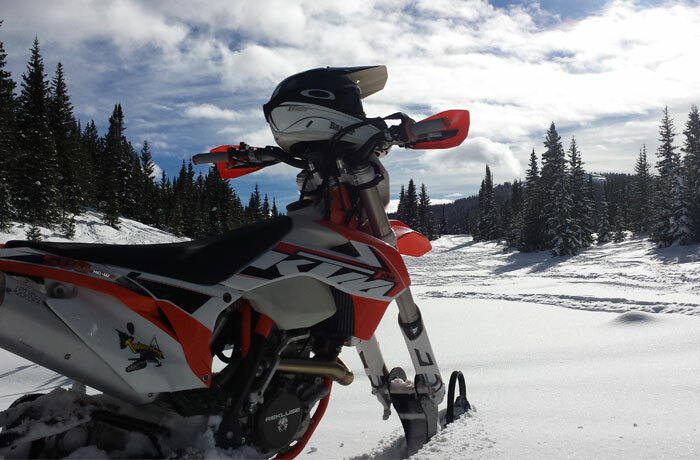 These 2016 KTM 500’s with the Timbersled setups float through the powder and the ease of use makes them so much more fun for a novice rider in comparison to a snowmobile in the powder. I personally was surprised at how easy it was to turn them in the powder even though I admittedly had to bail a few times. However, once I got the hang of it; the turning, the balance, and the overall control of the bike was more user-friendly to an unskilled rider than a snowmobile could ever hope to be. 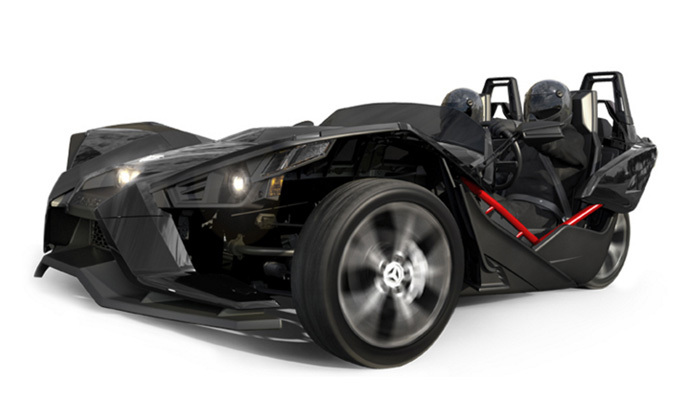 Don’t, get me wrong, I love snowmobiles but I think these are the future of back country travel. It’s even worth noting the agile maneuverability that they offered through the tight trees and around hazards such as exposed rocks and stumps. The real trick was learning when to be aggressive on the bike – steep climbs require you to throttle down and go for it. 2nd and 3rd gears were my bread-and-butter for climbing while being in a standing position – I’m not sure if that is correct but it seemed to work. The other issue to note is the point in time when the bike begins to dip on you. Every once in a while I would feel the bike begin to sink on the front ski and it felt as though I was sure to fall over. However, with just a quick turn of the throttle, the bike rights itself instantly going from a surefire falling over, getting stuck situation to being on plane and moving over the surface again. All-in-all. The Timbersled took about 15-20 minutes to really get the hang of and after that, you’re off and cruising. The bikes look intimidating or as a friend recently said on facebook, “slight terrifying” but in actuality, they are anything but. I’m looking forward to getting my wife on one who has even less experience than I do when it comes to riding dirt bikes but I believe that she will get the hang of it just as quickly as I’m sure most anyone would who truly wants to give it a go.